These cards are limited to 1500 decks and have a great feel to them. Look at the pictures to see what you are getting with this 56 cards deck. All the standard cards plus a blank facer, two different color jokers with the same bull’s face and an extra Jack of Hearts. The rest of the pips are close to standard. Compared to Bicycle 808’s, the Court cards have very similar drawings, but the eyes have bolder ink in the lines. The flap on the tuck case is inscribed with the words “Deceptive Arts First Edition deck. May it serve the Master as a reminder that ‘you’ are the creator of your own reality”. The box has a matte recycled paper feel to it and the cards themselves faro wonderfully. 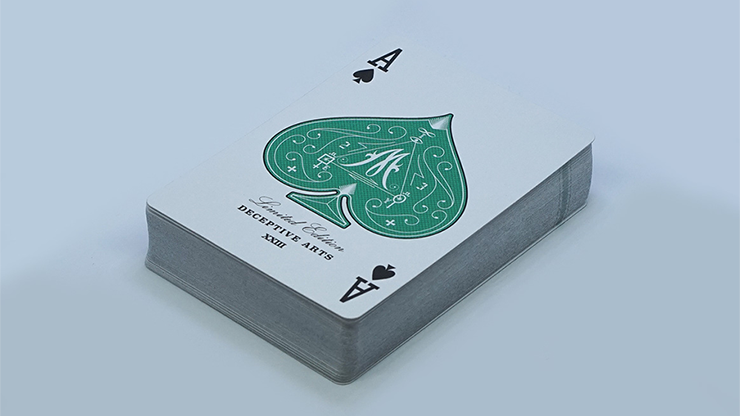 The cards new deck order are Ace to King, Ace to King, Ace to King and Ace to King. 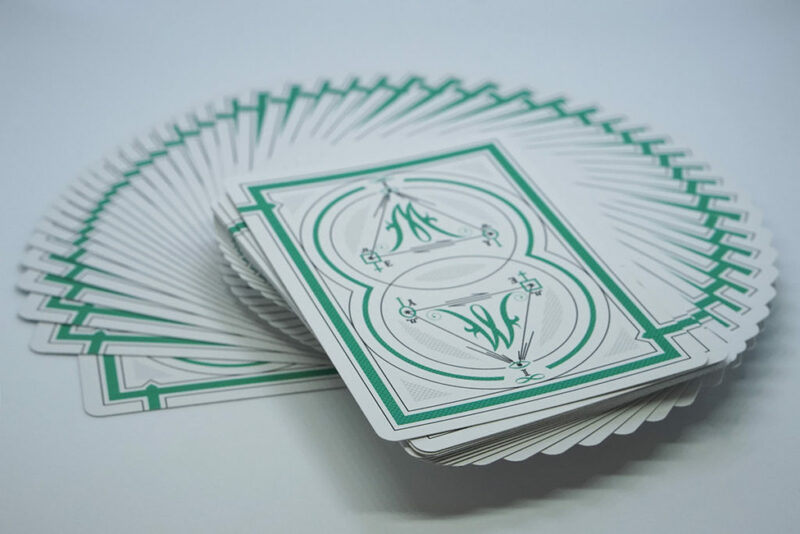 All the cards are side marked with a green stripe, surrounded by two thin black lines which make a nice line when spread or fanned. Cards are great, look is fantastic feel is superb. Thanks to Murphy’s Magic for putting these in my hands so I can describe them to you! For $13 this limited edition deck is a real good one. Get two; one to keep and one to play! Card on Ceiling by Jamy Ian Swiss and Vanishing Inc.